If using the Internet Explore browser to view this site you should use version 6.0 or greater. 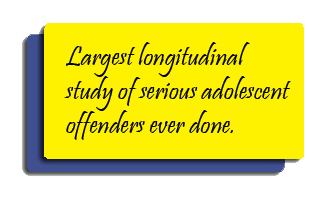 The Pathways to Desistance study is a multi-site, longitudinal study of serious adolescent offenders as they transition from adolescence into early adulthood. Between November, 2000 and January, 2003, 1,354 adjudicated youths from the juvenile and adult court systems in Maricopa County (Phoenix), Arizona (N = 654) and Philadelphia County, Pennsylvania (N = 700) were enrolled into the study. Each study participant was followed for a period of seven years past enrollment with the end result a comprehensive picture of life changes in a wide array of areas over the course of this time. To identify distinct initial pathways out of juvenile justice system involvement and the characteristics of the adolescents who progress along each of these pathways. To describe the role of social context and developmental changes in promoting desistance or continuation of antisocial behavior. To compare the effects of sanctions and selected interventions in altering progression along the pathways out of juvenile justice system involvement.